Fortress Of Freedom Board :: View topic - TWENTY6HUNDRED's Album "Until The End" Released! TWENTY6HUNDRED's Album "Until The End" Released! Posted: Mon Apr 23, 2018 6:59 am Post subject: TWENTY6HUNDRED's Album "Until The End" Released! By Laura Tommasone, FOF Inc. / FOF Records Inc. The front of the CD! This is the band's third CD with FOF Records with the first happening all the way back in 2006! This latest album brings the band a more cohesive sound under producer Mihai Trusca who also plays guitar and vocals on the new album. In addition to the usual band mates Michael, (guitar and vocals), Jim (Bass, vocals) Randy (drums), Mihai (guitar, vocals) we also had our own Shane Murphy as a featured artist on one song called Transformation. 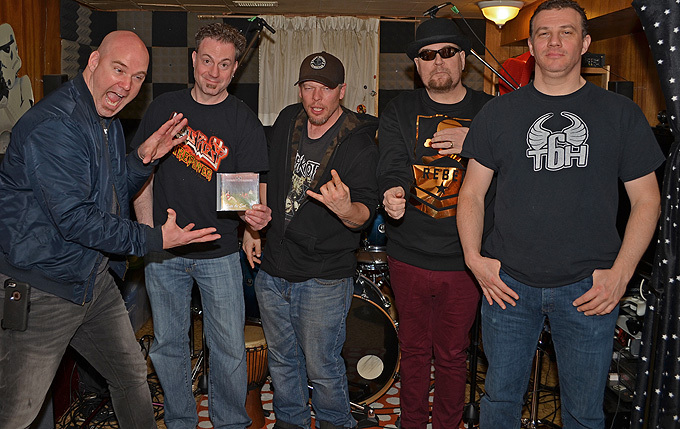 (Left-Right) Randy, Jim, Shane, Michael and Mihai at the CD release party! As noted before the album is produced in CD form for promotional use but also available in its full 16 bit sound through Amazon on Demand. On the digital side you and buy the album or stream it on all the popular streaming sites like Spotify or Tidal or Google. 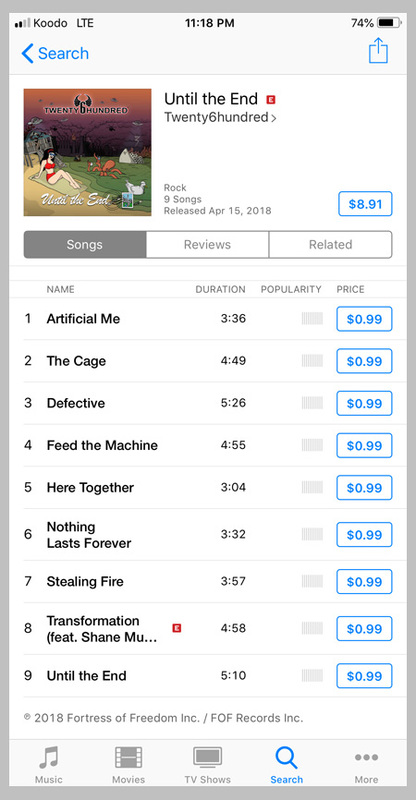 Album information summary via an iTunes snapshot! So all of us at FOF congratulate TWENTY6HUNDRED for another great album and wish all the band mates continued success and creativity on their next project!